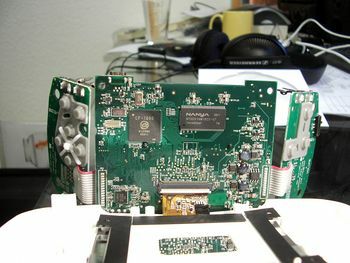 A Didj or Leapster Explorer you are willing to disassemble and solder parts to. DJHI or similar mechanism to perform a UART boot or SD Card boot. The LF1000 processor contains a current-driven digital-to-analog converter that can drive an external screen via CVBS (composite video). 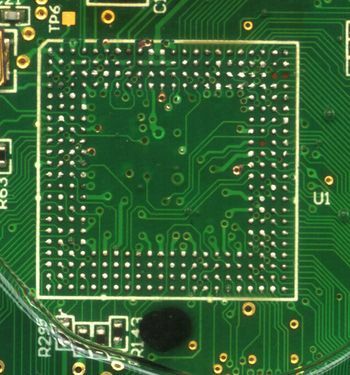 On the Didj, the DAC connection is exposed via Test Pad 6 (TP6) which can be found on the CPU side of the board. 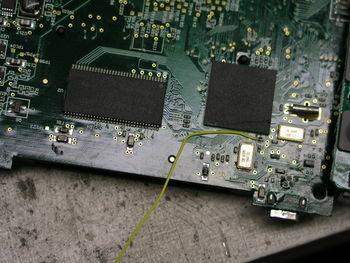 Reassemble your Didj, routing the additional wires appropriately. 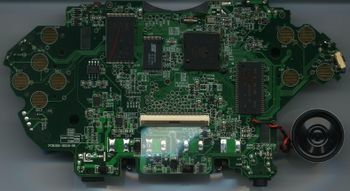 On the Leapster Explorer, the DAC connection is exposed via Test Pad 30-Right (the pad to the right of the label marked TP30) which can be found on the CPU side of the board. Reassemble your LX, routing the additional wires appropriately. 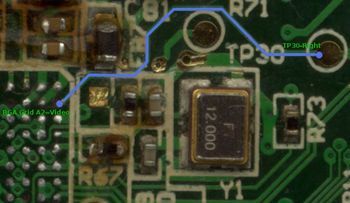 Connect the side of the circuit with the resistor to the Didj or LX, and the other side to your TV's Composite input jack. The LF Kernel sources already contains all the code necessary to enable you to connect your Didj to a TV via a Composite Video (RCA-style) connection. To enable this capability, you must first have a kernel cross compilation environment set up (see Requirements). The adjustment itself is simple. If you have just set up your kernel compilation environment and are compiling for the first time, set up your kernel by running make menuconfig. This generates a file called .config . Make any other adjustments you want and then build your kernel. Thats it! Shortly after rebooting, you should see an image on both the LCD and your TV. The Software setup for LX is a bit more involved. The code that activates tv-out seems to be toggled based on a GPIO, so it may not be as simple as setting a compile flag as mentioned above. Instead, the fbdev driver mentioned here is set up to support TV-out mode using the same configuration directive as is used for Didj. Make any other adjustments you want and then build your kernel. Take the resulting zImage, make a cbf file, and load it onto the LX using USB boot. Add user-space external screen control. This page was last edited on 10 May 2011, at 10:12.